What if six months ago you made a contribution to an organization that claimed to be an animal sanctuary, and only now discovered the truth about the facility. Perhaps some of its animals are sold to a ranch that allows canned hunts, meaning the animals are shot by “hunters” for “sport”, with no way to escape. Or perhaps the exotic animal facility you supported for its educational efforts, turned out to imprison tigers in small enclosures or breed them in a basement. One mission of the Global Federation of Animal Sanctuaries is to ensure that donors are not deceived in this egregious manner, and to support and shine a spotlight on legitimate and outstanding sanctuaries worldwide. These sanctuaries do the difficult and dedicated work of providing animals with the highest standards of humane care, free of any form of further exploitation. Fortunately, many animal sanctuaries are exactly what they claim to be… an end, finally, to all forms of abuse and exploitation for the animals in their care. For these animals… whose profound losses can never be regained… sanctuaries are the line in the sand that says never again. It is over. You are safe now. At last. Examples of outstanding sanctuaries are many. Asiatic black bears, cruelly incarcerated in Chinese bear farms and milked for their bile, may be rescued and rehabilitated at the Animals Asia Foundation’s bear sanctuary. After enduring years of suffering, these bears can at last move and roam, feel grass beneath their bodies, and be free of needless pain. Cows, pigs, chickens, sheep and other animals exploited by the agribusiness industry find refuge in the rolling hills and grass at Poplar Spring Animal Sanctuary in Maryland, Farm Sanctuary in New York, and on the other shore of the United States at Animal Place in California, to name just a few of these stellar facilities. Young African elephants, orphaned when their mothers are shot by poachers, once again enjoy a time of play in mud pits and watering holes at Daphne Sheldrick’s orphanage outside of Nairobi, Kenya. Numerous species of monkeys, formerly languishing in laboratory cages or barren zoo enclosures or people’s homes where they were kept as “pets”, can climb trees and play with others of their own kind at the Born Free USA Primate Sanctuary in Texas. The most fortunate of exploited African and Asian elephants, often aging cast-offs of the circus and zoo industry, may find a final home of relative freedom and significant bonds with fellow elephants at The Elephant Sanctuary in Tennessee or the Performing Animal Welfare Society Wildlife Sanctuary in northern California. These sanctuaries, and others like them, walk the talk of recognizing each animal as an individual whose quality of life matters. These sanctuaries represent a pinnacle of humanitarianism, in which humans recognize their obligation to not only to stop exploitation of those at our complete mercy, but also to make retribution, the best that we can, for the often unspeakable wrongs done to these individual animals. All too often, however, the public is misguidedly led to believe that any captive animal facility—especially those with exotic wild animals—is a sanctuary. The operators of these “pseudo-sanctuaries” pray on this misconception to buy and sell wildlife and get financial support from the unwitting public. 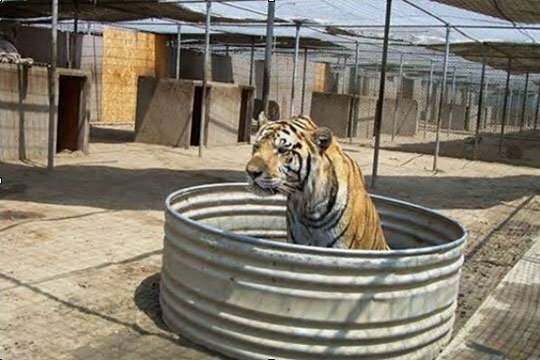 Tigers provide a sad example of exploitation hidden under the guise of a sanctuary. One hundred years ago there were an estimated 100,000 tigers remaining in the wild. Today, there are well fewer than 5,000. Yet more than 5,000 tigers are thought to be held in private hands across the United States today. But these tigers are not in naturalistic, humane enclosures with their behavioral, physical, emotional, and environmental needs met. They may be caged behind wire fencing with broken, protruding barbs. They stand on concrete, which may be splattered with their own feces. The only relief they get from the baking sun is a metal tub of filthy water. This is not a sanctuary, it is a prison. With recent high-profile incidents of animal sanctuaries closing their doors due to lack of funds, or being investigated for improper animal care, there has been no widely known and respected international organization to turn to for help or for objective standards specific to sanctuaries. With no such reliable standards, any commercial operator or roadside menagerie can call itself an “animal sanctuary,” and the public is hard pressed to distinguish between legitimate operations and substandard ones. GFAS was created, in part, to help the public make those distinctions with confidence. GFAS is the first international accrediting organization focused on animal sanctuaries. GFAS accreditation is a “seal of approval” that donors can rely upon. Only those sanctuaries meeting solid standards will be accredited. Donors and foundations can rely on GFAS to objectively verify that animal sanctuaries are providing animals the standards of care that they deserve, and that a sound infrastructure is in place. Through the process of accreditation, GFAS is bringing recognition and support to legitimate sanctuaries around the globe, while illegitimate commercial operators or substandard roadside menageries that merely call themselves a “sanctuary” are exposed to the public.